Well, one thing is for sure, certain greyhounds love children and most children love them right back! Recently, GALT volunteers, Scott and Joann Young, daughter Cheryl Boeve, and Buffy Milner, took four greyhounds, Moon Shine, Dana, Hank and Katina, to Anderson Elementary School for GOLD (Greater Outdoor Learning Day). This is an annual event, and parents, companies, and friends set up booths where they teach the students about their hobbies, sports, jobs or other interesting things. 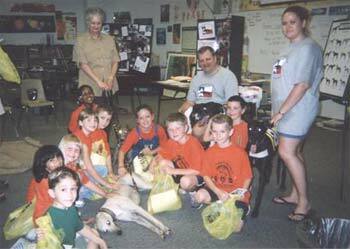 It was a rainy day, so they were provided a classroom in which to set up - storyboards about the greyhounds, muzzles, a racing silk and brochures - and, of course, greyhounds. 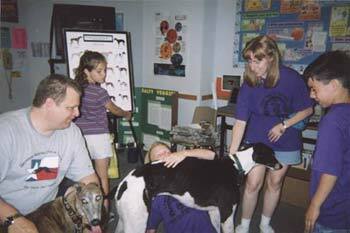 The kids came in small groups to see the dogs and learn about retired racers. The volunteers made presentations about the life of a racing greyhound and also explained what GALT does to save these wonderful dogs. At the end of each presentation the students were quizzed, using the color chart, about the color of each of the dogs there. The student to answer each question right got a bumper sticker. Of all the dogs, Moon Shine gave the kids the most trouble because she is a blue brindle. The dogs loved all the attention and the students fell in love with them. Some who were initially frightened even relaxed and came to pet the gentle greys. A few of them wanted to take the dogs home and others were determined to convince their parents that they needed a greyhound of their very own. Word traveled fast that there were greyhounds in the building, so there were a few more groups visiting than had been scheduled. The students asked great questions and seemed to be very interested in how fast the greyhounds could run and how old they were. 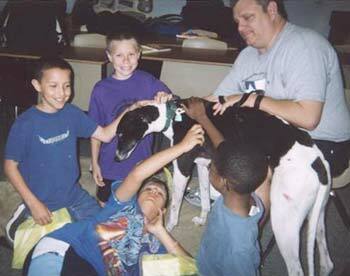 Hank seemed to be most of the children's favorite because he is the biggest and most affectionate. He liked to lean on them, almost knocking them over. They laughed at Katina because she rolled on her back a few times almost demanding that they rub her tummy. They thought she was the goofiest dog ever! Moon Shine and Dana were a little more laid back -- just sniffing all the kids and enjoying lots of petting. Dana wore the racing silk most of the time, which made her look like she was still a racing dog. The dogs were taken home at lunchtime to rest a little bit and then came back for the second half of the day. The rest time didn't seem to be long enough though because the dogs were very tired. Hank fell asleep while all the children hovered around him and some even used him as a pillow. When it was time to go home all the dogs were fast asleep, once again demonstrating their basic couch potato instinct. This was a Greyt day for the kids, the dogs, as well as for the volunteers. 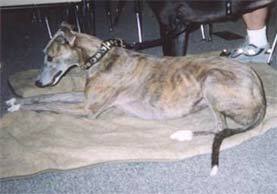 Thanks to Anderson and to the students for welcoming GALT to their school and having so much fun with the greyhounds.